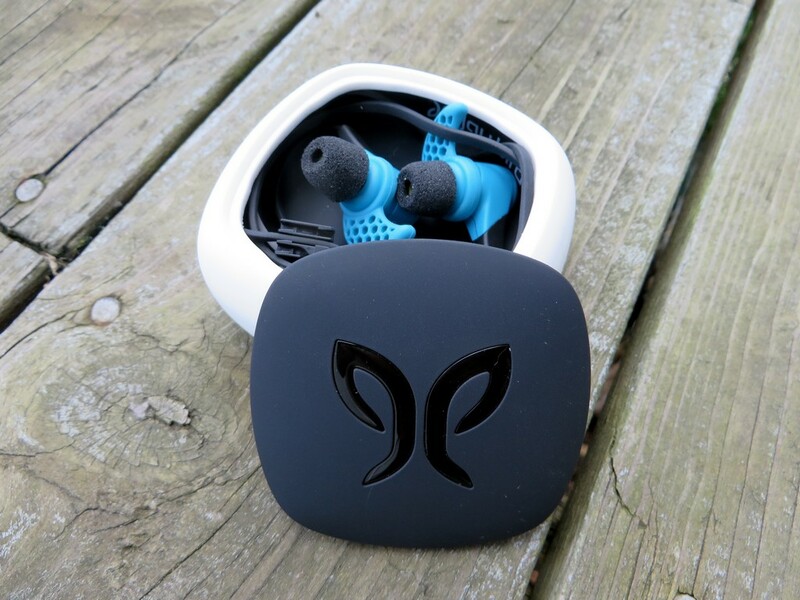 The Jaybird X2 Bluetooth headphones are wireless, battery-powered headphones that are designed to stay in place during physical activity, such as hiking, biking, or running. With an extended battery, ear fins for holding power, and a sweat proof design, the X2’s are aimed at those with an active lifestyle, but how do they perform in the field? The design of the X2 headphones is unique. Instead of a large battery pack that hangs off the neck, the battery is instead embedded into the earphone itself. This eliminates the need for large, bulky neck bands or power packs that typically mar otherwise stylish designs. The ear fins, small curved ridges that allow the headphones to grip snugly inside the gear, can be removed and come in various sizes for a custom fit. 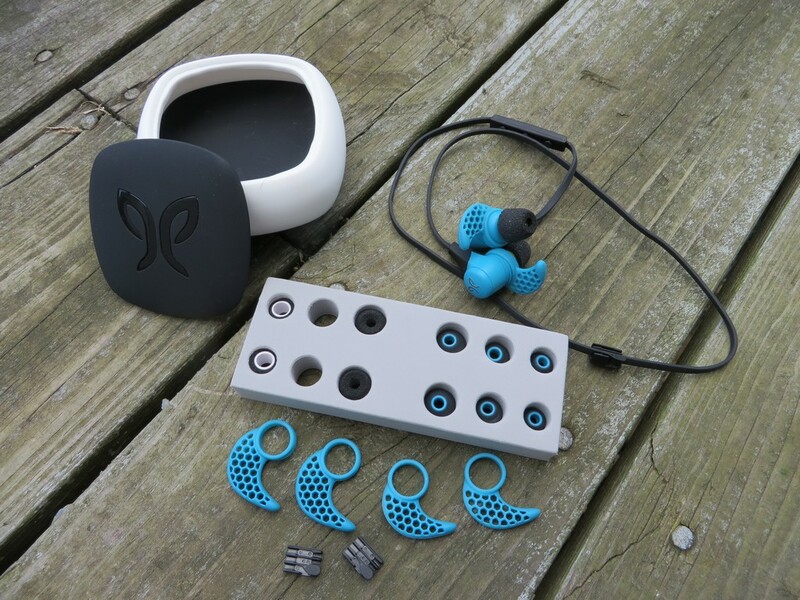 Also included are two types of ear tips, foam and silicone, so the user can further fine tune their listening experience. 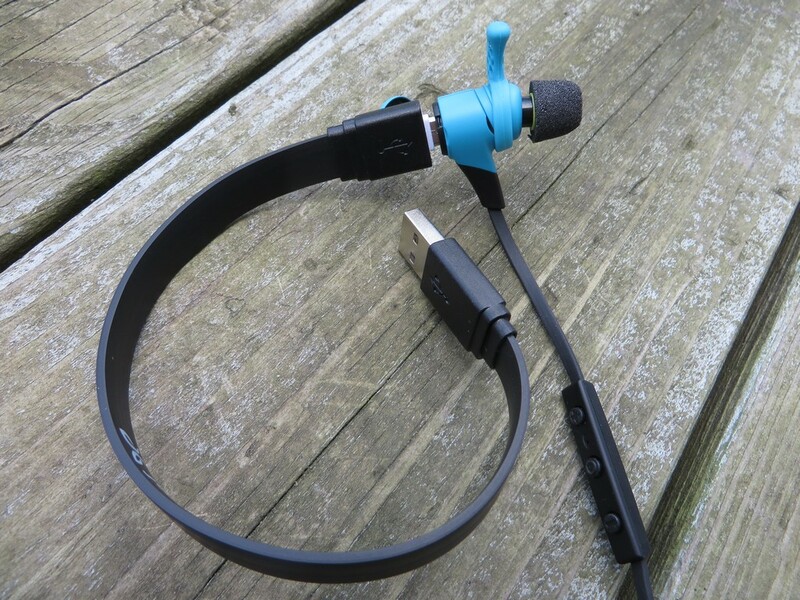 The headphones charge via an included USB cable that connects directly into the earpiece, and controls are embedded on the cabling, which can also be wrangled using the included organizer. The entire package weighs half an ounce, retails for $179.95, cranks out 8 hours of battery life, and comes in a variety of colors. Not having a cord is the biggest selling point here. No cable means no getting tangled up in wires while you’re trying to navigate up rock scrambles or when shifting gears while mountain biking. Furthermore, there is no large battery pack that rests against the neck, or hanging around the neck like a necklace. This improves the look and the comfort of the headphones by reducing how much you have against your body at any given time. Sound quality is pretty solid, producing clear, distinguished tones across a wide range while still maintaining a fairly flat, even reproduction of bass, mids and highs. No one frequency is overpowering, or particularly lacking. Separation is also quite good, managing a clear distinguishable line between various sounds and channels. The lows are impressively well represented, with smooth powerful tones that fill the entire sound scape without burying the other frequencies..
Customization is great, not only providing a wide, attractive range of colors, but also a wide range of fit. Included were 3 sizes of fins, and 3 sizes of ear tips, in both silicone and foam per preference. The headphones stay in great, not shifting during workouts, biking, or hiking. The fins do an exceptional job of locking them in, without being intrusive or painful, although they do take a little getting used to. The Bluetooth connection is solid, never causing interruptions or skips due to frequency breakup or loss of connection. Pairing was simple and straightforward, with the touch of only a single button on the headphones. There were recognized instantly the first time, and every time after. The included silicone storage case does a fantastic job of keeping everything together, while also being simple to use. It looks great, and is built well also. Battery life has been exceptional, besting most headphones of similar quality at about 8 hours of solid use. It took some real trial and error to find a good combination of ear tips and fins to both sound good, and feel good. Once I did, however, I was fairly happy with the fit, although I wish the foam tips were a bit softer. I settled in on medium fins, and medium foam ear tips which provided a happy medium, which is pretty impressive for my sensitive ears. The cord management clips could use some improvement, as I occasionally had a wire come out while stuffing them in and out of the carrying case. They always stayed in place while in use though. The X2 headphones from Jaybird make cutting the cord while staying connected easier than ever, thanks to a single button connection and integrated on line controls. They provide great sound quality for a Bluetooth headphone, while also providing a moderately comfortable fit. The wireless connection was always solid, leaving me without a single disconnect and providing a clear, punchy sound at all times. The extended battery life and huge selection of included fit customization options ensure long distance listening pleasure and comfort. A middle of the road price makes the X2’s even more attractive, especially when paired with the superb, clear sound. 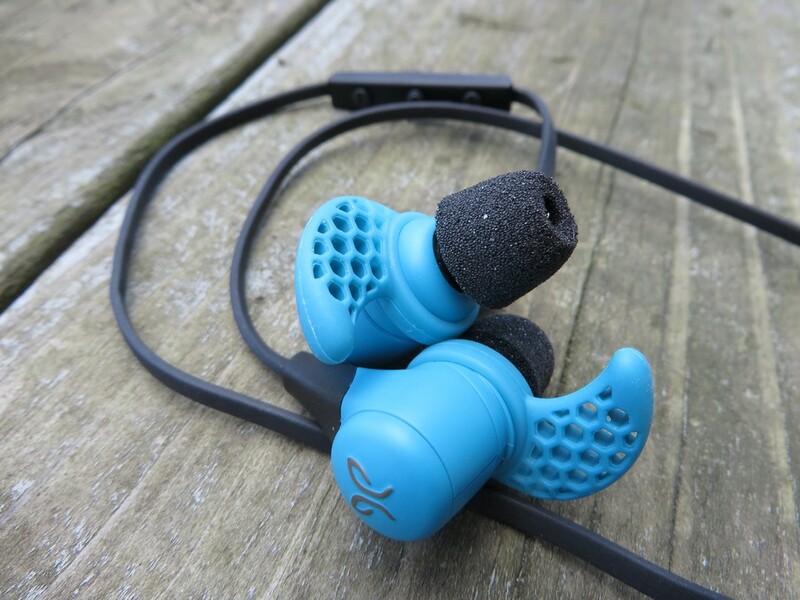 For more information on Jaybird and the X2 Headphones,check out http://www.jaybirdsport.com/X2-bluetooth-headphones/For information on our rating system and our testing procedures, check out our About us/ Contact us page. I want to extend a big thanks to Jaybird for their support and for providing us this great set of headphones for review. Our full disclosure can be found here. Thanks for reading! If you have any questions, comment below, send us an email, or find us on Twitter or Facebook (links on the right). Every Kid in a park program. Free admission to National Parks for 4th graders. Thanks for the article and sorry to revive an old post. Interested in your comment about Bluetooth connectivity. I’m experiencing intermittent dropout with phone in pocket. It’s an iPhone 6s. Wondering what device you’re connecting to and if you had any issues in pocket? Hi Dan. Sorry it’s giving you issues. I’m using an Android via Samsung (j7), with no issues. Does it only do it in one location or when you’re out and about? It could be interference, or possibly a bad unit.